Simone (CEO) of Lifelite has visited 47 Provinces in 14 days and transported in various unusual modes of transport. Bucks PGM Jon brought Simone to Henry Moore Foundation Hertfordshire in his Porsche Carrera. 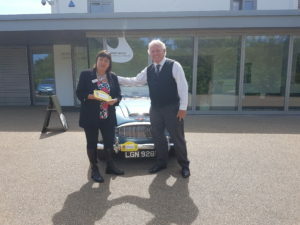 Hertfordshire welcomed her in a 1966 Austin Healey Mrk3 3000 GT. They set what they believed was a tough a target of £50k but have passed that with ease thanks to the generosity of Masters across the UK. Chris Noble Provincial Grand Charity Steward handed over a cheque for £3,750. The money will be donated to local Children’s Hospices. WBro Chris then met Priya Singh of Noah’s Ark Children’s Hospice in support of their project building a new centre in Barnet which should be completed June 2019.